Jayo Santiago, more known as Flip-One is a graffiti pioneer in The Philippines, a visual artist and an important figure in Pinoy Hip-Hop. I write Flip-One, representing Samahan Batang Aerosol from Manila, Philippines. Flip-One is more my graffiti name but I write various words in "Baybayin" alphabet. My introduction to graffiti was through hip-hop as I got into the culture back in 1990 with my closest friend; now known in Pinoy Hip-Hop as Flow-One. It was the year when hip-hop began to grow in The Philippines. I was fortunate enough to experience the birth of the local scene and witnessed its evolution. But it was a magazine article on New York Hip-Hop that got me into graffiti plus the book, Hip-Hop: The illustrated History of Break Dancing, Rap Music and Graffiti which I luckily found at my school's library. I painted my first piece the same year in a canal in Makati with two can of Tamiya paint which I used for Gundam. 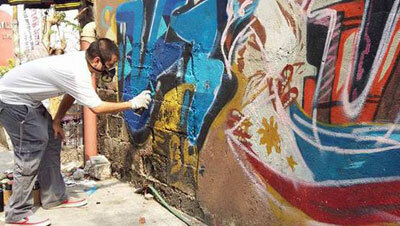 It wasn't only the first graffiti piece I did but also the first one in The Philippines. It was until 1993 when I started writing Flip-1. Before that, I wrote various words I can think of that sounded hard. I chose that name as "flip" is one of the slang terms that describe Filipinos. Having a number at the end of the name is common with graffiti writers and I chose "1" as I was the pioneer in The Philippine graf scene. With Flow-1, we both founded Subway Army the same year and was originally a hip-hop crew. We later on focused on graffiti and the name changed to Samahan Batang Aerosol. It was originally composed of myself, Flow-1, Beat and Askal and we became the premier graffiti crew in The Philippines. My graffiti style is a modified version of The Filipino "Baybayin" alphabet. Baybayin was the ancient abugida type writing system used throughout The Islands of The Painted Ones, now known as The Philippines. After Spanish colonization and western influence, Filipinos began using The Latin alphabet in writing our local languages. But Baybayin is well preserved, rediscovered and studied by various scholars, artists and enthusiasts including myself. Each region in The Philippines have their own system of writing Baybayin. I use Tagalog Stylized because of Tagalog identity and also being a Manileño. The main focus in graffiti is always the letter, at least the style that I do. Some pieces will have characters, background, and all that stuff but the letters are the base and we create a new style out of it. It is the same with Baybayin where I add some funk to the letters and still looks hip-hop. At the same time, I showcase Filipino culture by adding some local elements to the piece such as the weaving patterns of The Cordillera Region, paticularly the Bahag loin cloth. Before, my earliest pieces were based on the New York "wild-style" and then switched to a "mecha" style influenced by Gundam and Transformers. But I developed a cultural identity to graffiti together with my crewmate Bonz, who used a Visayan Esguerra Baybayin script fused with his own Aklanon-influenced style. I use The Roman alphbet when I do throw-ups. Most throw-ups have a bubble-like style but I adapted a Pinoy revolutionary-like "mandirigma" font with sharp edges. I also use this style when marking my crew's name or when stating a message. People know me for graffiti but I'm a visual artist in my own right. I also do graphic design, illustation and photography. But Graffiti is what I like to do and I've been doing it for over two decades and still active in the scene! It is one of those that I'll be doing for A VERY LONG TIME! Shoutouts to God, my family, friends, my crewmates representing Samahan Batang Aerosol and to the Pinoy Hip-Hop heads out there! © 2016 Flip-One | Samahan Batang Aerosol, Metro Manila, Philippines. Site concept and design, Jayo Santiago | ELEMENTOZ CREATIVE STUDIO.